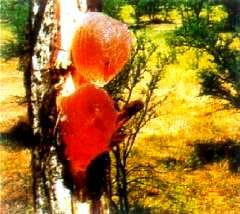 Tragacanth or gum tragacanth,is a gummy exudation from the leguminous shrub Astragalus gummifer and related pulse family plants of South Eastern Europe and Western Asia. It is obtained through incisions made into the stem of the plant. Tragacanth is almost insoluble in water but swells in it to form a stiff gel. It is used as an emulsifying agent, as a component of pills, hand lotions, and medicinal lubricating jellies, as a demulcent, and as a sizing material. A gum (sometimes called Indian tragacanth) from a plant of the sterculia family is sold as a cheaper substitute. Used in salad dressings, processed cheese, cream cheese, cottage cheese, ice cream and icing. May cause allergic reactions.